Quite simply our cat pig, purring. 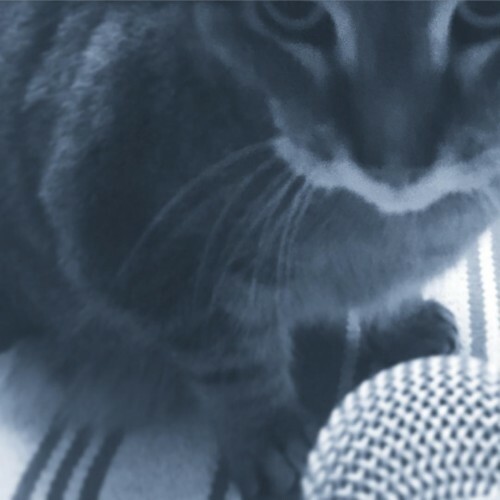 This is Purrcast number 32 with special guest Windup. 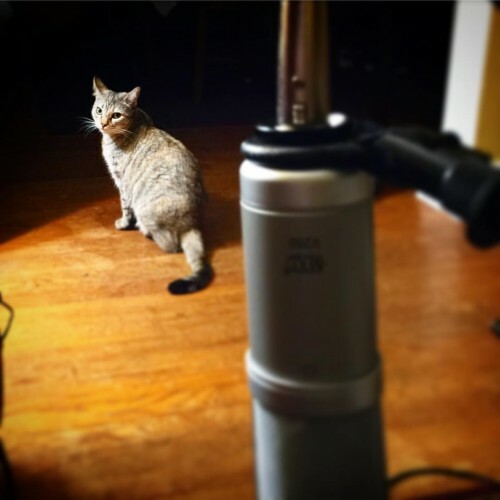 Once again asked to cat sit for a friend and as a value added feature I chased the cat around with a microphone for your enjoyment. Windup was found on the streets of Baltimore, was briefly at a shelter and then adopted by their original finder. There are many wonderful cats like Windup available for the adopting or fostering through your local shelter. This is Purrcast number 31 with the purring sound of Piglet. Despite being our second oldest cat, Piglet is the perpetual kitten of the household. That’s not because of his personality, his attitude is that of a grumpy old man. It’s partially his looks, the round face and disheveled fluffy fur, and partially because he was Justin and Amy’s first cat as a couple. Found as a sick kitten on the mean streets of Baltimore, he offset the grumpiness with typical kitten cuteness and impressive ear floofs, convincing us that he was worth both thousands of dollars in vet bills and a loving home despite his tendency to act like a jerk. One surprising thing about Piglet is that he doesn’t mind most of the foster cats that come through the Purrcast World Headquarters. 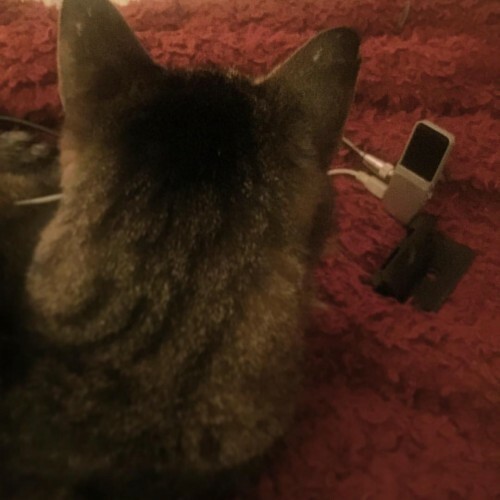 He may not be happy about them, but as long as no one runs across his head or jumps on him, he isn’t too concerned about who is staying in the guest room. 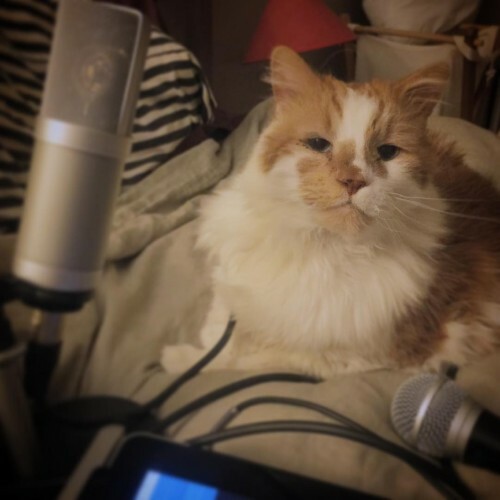 Piglet is probably our the most prolific of our podcasting purr-ers. He purrs for meals, for nip, for lap times, and bedtime. Bedtime is when he really shows off his purring skills. He sinks into the blankets and turns on the purrs, a steady rumbling with occasional deeper inhales and exhalations of contentment. On top of those he layers a little trill that is probably a result of his permanently stuffed up head. 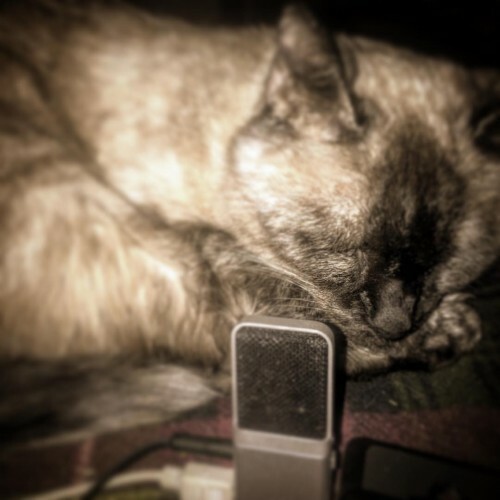 The whole performance can be hypnotic, and produces great audio for ASMR enthusiasts who like a little variety in their purring soundtracks. 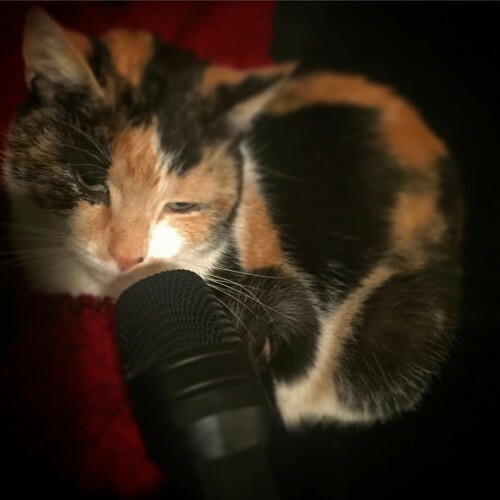 As a former street cat, Piglet would like to make sure everyone knows about the Kickstarter campaign for Tuna and the Acrocats. 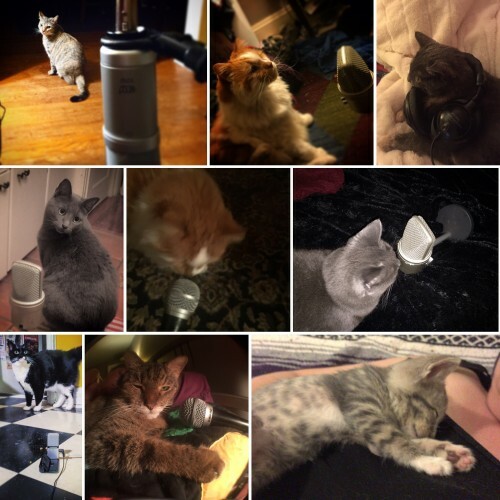 This mobile cat circus/cat band/cat fostering group is in need of a new tour bus so they can thrill and amaze audiences across America while helping place needy cats and kittens in new homes. Their fundraiser is in its last week, so check out their page, pitch in if you’re able, and please spread the word! 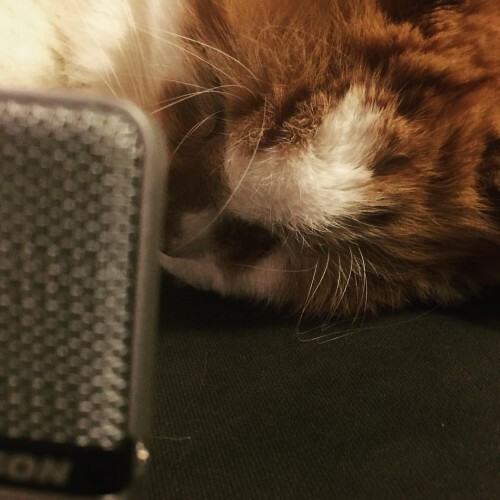 This has been purrcast number twenty eight featuring purring by pig. 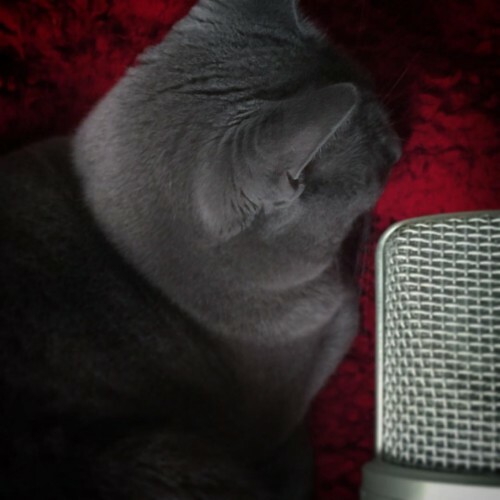 Purrcast is recorded live in front of a studio audience. 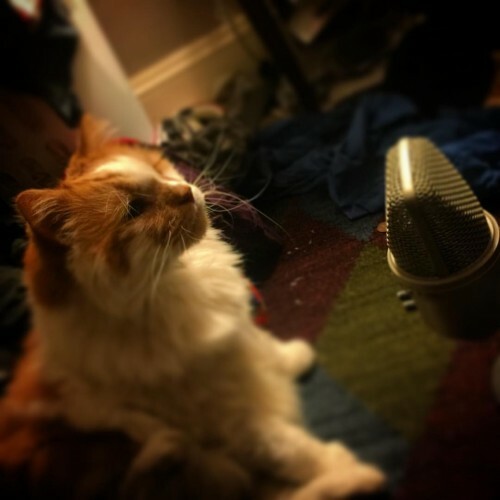 If you like purrcast you can show support by giving us a good rating on iTunes, saying hi on Twitter or Facebook and backing us at Patreon.